With entrancing collages and lyrical narration, the creator of the acclaimed Mirror follows the epic flight of an extraordinary bird. Each year, bar-tailed godwits undertake the longest migration of any bird, flying from Australia and New Zealand to their breeding grounds in the ... read full description below. With entrancing collages and lyrical narration, the creator of the acclaimed Mirror follows the epic flight of an extraordinary bird. Each year, bar-tailed godwits undertake the longest migration of any bird, flying from Australia and New Zealand to their breeding grounds in the Arctic and back again. They follow invisible pathways pathways that have been followed for thousands of years while braving hunger and treacherous conditions to reach their destination. 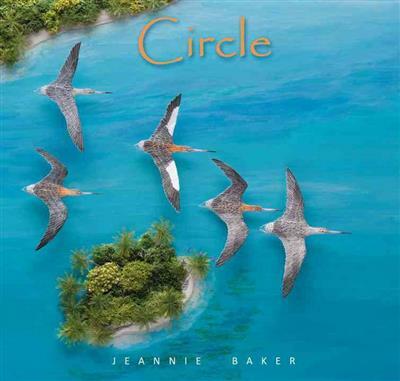 In Circle, Jeannie Baker follows the godwit s incredible flight, taking us over awe-inspiring scenes as the birds spread their wings above such beautiful landmarks as the Great Barrier Reef and China s breathtaking cityscapes. Jeannie Baker is the author-illustrator of a number of children's picture books, including the critically celebrated Mirror and the award-winning Where the Forest Meets the Sea. Born in England, she now lives in Australia.